Visuals, especially people, draw the attention of the viewer. And, in the case of the announcement we're making, the person shown is also going to be hosting the webinar in the announcement. Once the headline has been added, repeat to add paragraph text content. 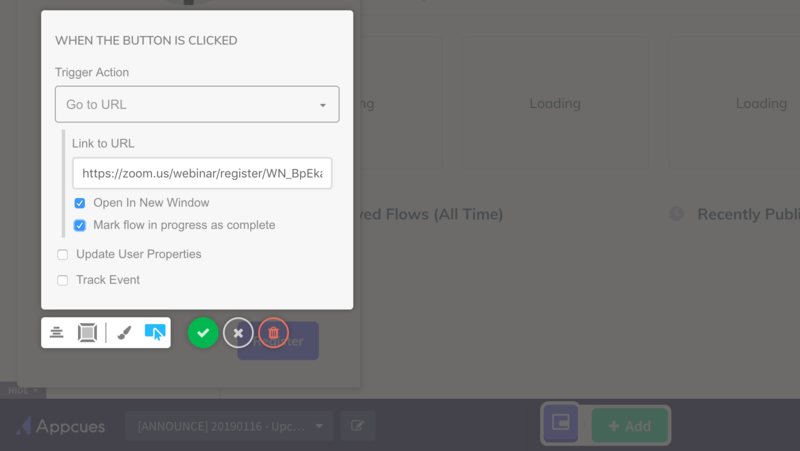 In the button settings, change the Trigger Action to "Go to URL", add the full URL, select to open in a new window, and also select to mark the flow as complete. Open Settings and scroll down to the Individual Step options, check the "Hidden" option for both the Previous and Next buttons. While we're working on buttons, let's customize the text to match the context of the announcement. Since this is a one-step flow, we don't really need the progress bar. But, if you like the framing it gives the top of the slideout then leave it in! Select where this slideout should sit on the page. Your targeting will depend on who the appropriate audience is for the content of the flow you just created. 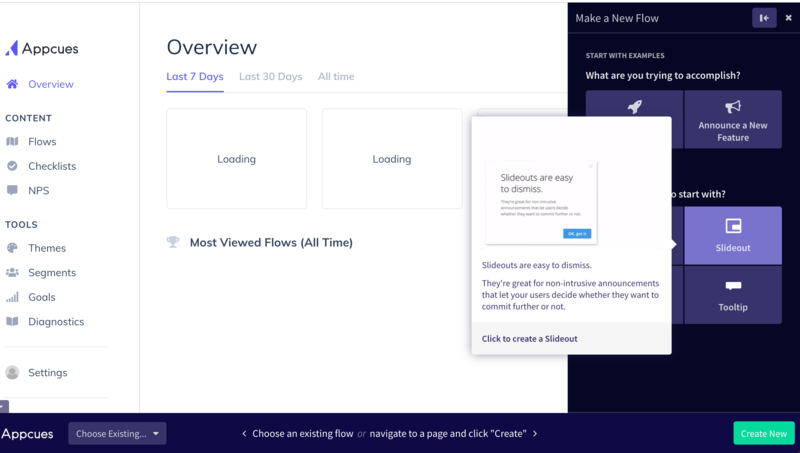 For this flow example we want to target anyone who has been an Appcues customer for more than 3 weeks. 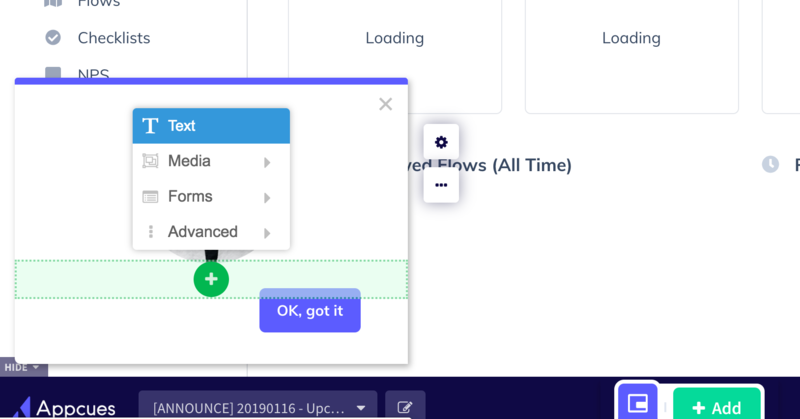 Before the 3 week mark we're showing our customers content that teaches them how to use the product, so we don't want to meddle in that workflow. Head back to "Target & Publish", or the Settings page of the flow if you're in your my.appcues.com dashboard. 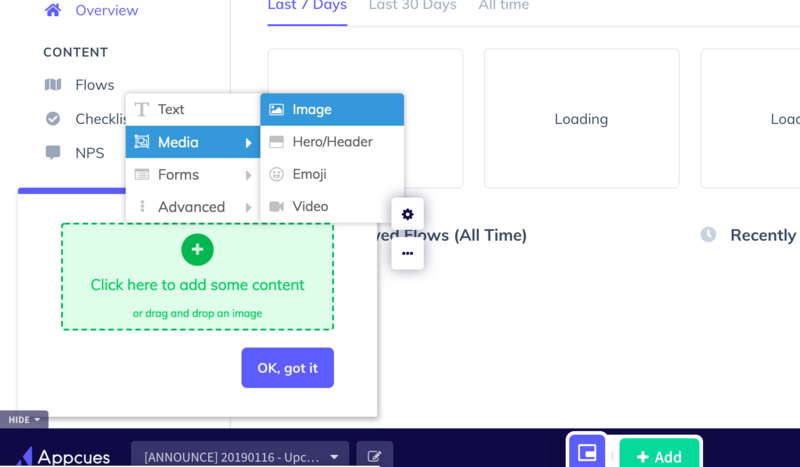 We're avoiding pages where a user would be building or editing their content, but in general an announcement like this could show on any page. Think about whether there is any place you'd absolutely not want it to show and simply exclude those URLs. We're just going to show to each user once, if they're interested they will sign up and vice versa. 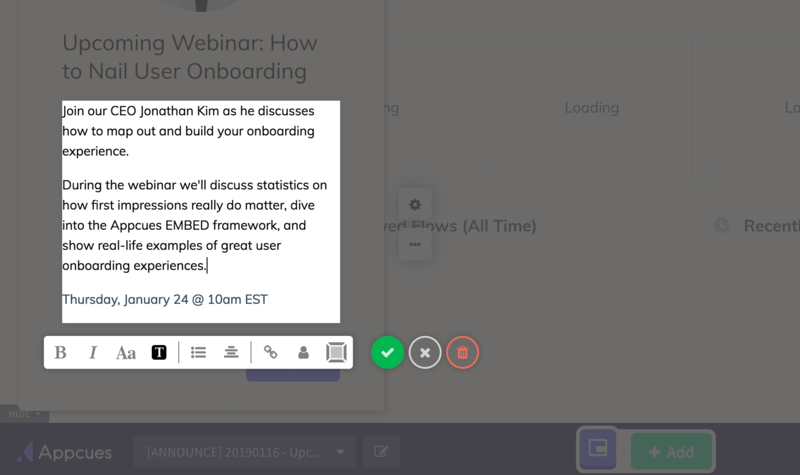 We could create a reminder closer to the webinar as a second chance to sign up, but that would be a different flow completely. Lastly, we're going to show this flow to anyone on an account that is at least 3 weeks old. If you have any questions reach out to success@appcues.com.